Amazing oceanfront location on a point; water on three sides of the house; facing Small Point Harbor to the east; Atlantic Ocean to the south and Casco Bay and islands to the west; decks; fully equipped kitchen; sauna. Launch your sail boat or kayak from our property (pocket beach on our property). Five miles to Popham Beach; Eleven miles from Bath. High speed internet, DVD, VCR. Two miles from golf; two miles from organic farm stand; 1/2 hour to Brunswick, with great shops, restaurants, summer theater (at Bowdoin College) and art museum (also at Bowdoin). Our mooring can accommodate boats as long as 35 feet. A WRITTEN LEASE MUST BE REVIEWED AND SIGNED TO MAKE THIS OFFICIAL. BOOKING NOT OFFICIAL UNTIL WE BOTH SIGN A LEASE. Bathrooms were remodeled in 2005.
the house is on a ledge overlooking the ocean. Water on three sides; we have a mooring for boats as large as 35 feet. Pets: dogs; no cats. Mooring. What a great place for the family to relax and bond! The pictures of the scenery don't do the area justice. Sunny, foggy, moonlight, you name it, just gorgeous! Plenty of room for the eight of us ranging 18 months to 75 years. The location was great for us. We traveled south to Portland and north to Bar Harbor. Even the White Mountains in New Hampshire were a great day trip. Facility wise, everything worked. The deck's safety is a little sketchy with rotting areas. We didn't feel 100% safe. Peeling paint was a concern with a toddler. Many screens had holes in them. With that said, we understand that everything can't be perfect all of the time. We would love to return for another great summer vacation. Dave: you are right....sometimes we are challenged by the fact that the house has dozens of windows and a dozen doors, all exposed to the elements, right next to the ocean. Again, this year, we addressed the screens and the decking, and we will do this again in the Spring, as we do every year....it is a constant process, and we hope that if you return you will find the house comfortable for you and your family. This house was amazing! Everything we wanted from our Maine vacation. The views are absolutely incredible. The pictures do not do it justice. Beautiful sunrises and sunsets. You are on an island and in somewhat a remote location but close enough to anything that you need. The main grocery and closest city is about 25 mins away. This was the perfect place for our vacation. The house has everything that you need complete with a sauna, Foosball table and outdoor shower. Also, you have your own private beach and hiking tail. We enjoyed many nights at the house cooking our own lobster/seafood feast as well as exploring the surrounding local communities. We had an amazing time and hope to come back to visit sometime. Thanks again! Point House feels so comfortable! Games, puzzles, great beds, all you need for cooking. Outside- incredible sunsets, star gazing, the waves lulling you to sleep. We were an extended family of 12 and felt there was plenty of room. We all loved the private beach, tide pools and sea glass collecting, as well as kayaking. Need to go exploring further?- Maine Maritime Museum is close by, as is Popham Beach State Park. Don't miss Totman Preserve. With 12 people the water storage is stretched to max so you must conserve. So glad we found this Maine gem! Fantastic location, everything we needed for a great stay was in the house. The host, Sig was wonderful.. Sig was only a phone call away and very accommodating. There were plenty of activities for the family and bringing my boat was a big plus. The house has a great mooring right in front of the house. I'll be back Sig.. This home was amazing and I would heartily recommend it to my closest friends and family. Aside from the magnificent views, it was a great "travel base" to nearby attractions including spa, parks, kayaking and great restaurants. It afforded us a peaceful and convenient stay and was conducive to lazy afternoons as well as staying in and cooking our own fabulous lobster dinners! Do not want to forget to mention the neighbor whom we contracted to take us on a water tour and gave us a demo on lobstering! Upon arrival we were all blown away by the magnificent views looking out at the many islands off West Point, Maine. We soon knew this was going to be a relaxing, peaceful week listening to the ocean surf beating against the rocks 30 feet below us. Watching the tides rise and recede, the lobster boats coming and going and the kayakers passing by was a daily occurrence. The house is large enough to cook and enjoy a home cooked seafood dinner for 8, or find a quiet spot to sit and just enjoy a favorite book. I especially enjoyed the outdoor hot shower to wash off the salt water—quite invigorating!! The house was outfitted with all necessary kitchen appliances, pot and pans, and utensils to cook large meals. Although there is a TV we never used it. The Wi-Fi did come in handy as the cell service is spotty. The land line did allow us to make phone calls when necessary. The bedrooms are large and beds very comfortable and all bedrooms have many windows which provided breadth taking views and allowed the sound of the surf to serenade us to sleep. Overall we thoroughly enjoyed the large home, many comfortable couches and chairs, game room with Foosball table and sauna. There is also a wood burning stove, we didn’t need it, and a game table for those who want to do one of the jigsaw puzzles. We have decided to return next year and can’t wait to head north for another week in the Point House on the Maine coast. 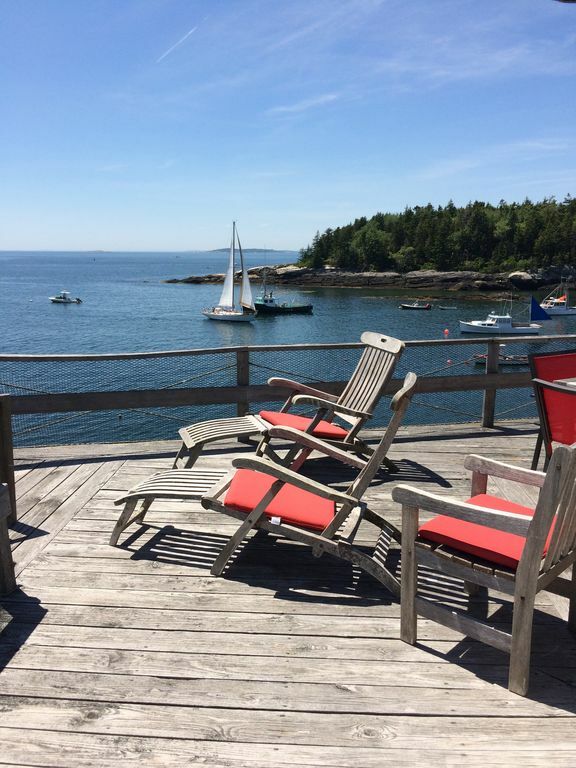 West Point Village is a small fishing village, on a point facing Small Point Harbor, the open ocean, and Casco Bay. Golf: Golf course 3 miles away.